The library has not passed any new funding measures since 1995. The Plant Levy Measure is for $14 million to renovate, expand and modernize. If passed, the levy would pay for new library branches in North Meridian (as part of the Linder Village project) and South Meridian (as part of The Hill complex). It would also pay for a major renovation of the main branch on Cherry Lane, which is 22 years old, and a renovation of a lease-to-own building in downtown Meridian for the unBound branch. If approved, this would cost taxpayers $1.00 per month for every $100,000 of taxable property value. Email director@mld.org or call 208.888.4451 ex 1226. You may also contact the Library Board of Trustees by filling out our online form. Visit Ada County Elections to register and learn where to vote. The purpose of the levy is to finance the construction and renovation of branch library buildings. The levy will be used to collect $1,400,000.00 per year for 10 years. The assent of fifty-five (55%) percent of the qualified registered electors voting in this election is necessary to approve the amounts proposed to be levied and collected. 15,000 square foot branch library as a part of the Linder Village commercial development project. 3,800 square foot standalone building in downtown Meridian as a lease-to-own over 2 years option. Renovation of the 27,600 square foot main library, 1,840 square foot annex building & parking lot redesign. Build a new 10-15,000 square foot branch at The Hill community campus in South Meridian. WHAT ARE WE BEING ASKED TO VOTE ON? 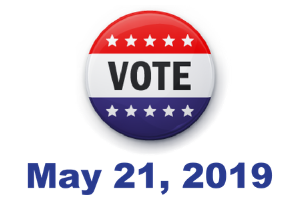 The General Election is held on Tuesday, May 21, 2019. IF THE LEVY PASSES, HOW WILL THE FUNDS BE USED? North Branch: 15,000 sq ft branch in the Linder Village commercial development project. An estimated $1.5 million will be used for finishing the interior and providing furnishings. unBound: Tech-focused branch in downtown Meridian. An estimated $1 million would fund the projected costs. Cherry Lane: Estimated $3.5 million for a renovation of the 27,600 sq ft main library, 1,840 sq ft annex building & parking lot redesign. The Hill Branch: Estimated $8 million to build a 15,000 sq ft new branch at The Hill community campus in South Meridian. This would be the final project in the timeline and would estimate beginning in 2025. WHAT ARE THE IMPACTS IF THE PROPOSED LEVY PASSES? If 55% of the Meridian voters approve the capital funding, over a 10 year period library space will be expanded; two new branches will open, the community will have more indoor public space, and parking at the Cherry Lane location will be improved. WHAT ARE THE IMPACTS IF THE PROPOSED LEVY DOES NOT PASS? Without capital funding, the North and South branches will not be built, unBound will potentially remain closed, and the Cherry Lane renovation will be minimal. WHAT IS THE LEVY IMPACT FOR ADDITIONAL TAXES? If approved, this would cost taxpayers approximately $1.00 per month for every $100,000 of taxable property value for 10 years beginning 2020. WHY DOESN’T THE LIBRARY DISTRICT SAVE AND PAY FOR THESE PROJECTS FROM THEIR RESERVES? Unlike other entities, public library districts cannot legally pay for new construction from reserves. Bonds and levies are the only legal mechanisms for expanding and building new locations. WHY NOT FUND THE NEW LIBRARIES THROUGH PHILANTHROPY? A fundraising campaign would require delaying the projects. There is also a degree of uncertainty associated with fundraising; we would not be as confident in what could be accomplished as it would be contingent on our ability to raise funds from a select few people. However, funding these projects through philanthropy could indeed offset a tax impact. The library is in the process of creating a Foundation in order to be able to accept philanthropic gifts in the future and independently support capital needs. IF FURTHER FUNDING IS NOT SECURED, THAT STILL LEAVES THE CHERRY LANE LOCATION IN A STATE OF ONGOING DETERIORATION. WHAT ARE YOUR PLANS TO REMEDY CHERRY LANE’S PRESSING STRUCTURAL ISSUES WITHOUT SECURING MORE FUNDING? Legally we can address renovation needs using our reserves. However, we are not legally allowed to expand our footprint and would likely only be able to conduct structural triage, fixing the building’s most critical needs. We would not likely have enough funds to address the way that the building functions or how the community uses the space. AFTER MERIDIAN DID NOT PASS THE TWO BONDS IN 2015 AND 2016, WHY ARE YOU RUNNING ANOTHER? Both in 2015 and 2016 the majority of residents voted in favor of the measure, just not the supermajority required to pass bonds. One impact of the last measure would have meant taking on public debt in order to fund new library locations. We are posing a different question to the residents this time; under this proposal, we would not incur public debt through Bonds and would only spend funds as they are collected over the course of a 10 year period. The library has not passed an additional funding measure that raised taxes in 22 years. The last bond to pass was in 1995 that built the Cherry Lane library and has since been paid in full. HOW ARE WE NOW GETTING MORE FOR $14 MILLION THAN WE WERE WITH THE BOND YOU TRIED TO PASS IN 2016? This time, a North Branch would be part of a larger project a developer is leading and working with the library to occupy. By only having to finish & furnish the interior of a new building, this reduces the cost of opening a stand-alone library branch. This allows us to reallocate those dollars to the Cherry Lane renovation and unBound facility. WON’T BUILDING NEW LIBRARIES BEGET MORE FUNDING NEEDS? MORE SPACE TO POWER, STAFF, AND MAINTAIN WILL LIKELY REQUIRE MORE TAX DOLLARS. We are not planning to come back to the community to ask for more operational budget support. The projects and timeline were selected by the Library Board of Trustees based on long-range operational financial projection so that no increases outside of the allowable 3% increase will be needed. These plans have been made with consideration for anticipated population growth and land use and traffic plans. Here in Meridian, demand for our resources and programs is continually climbing. Checkouts have increased by almost 50% in the last 5 years from 1 million in 2013 to 1.6 million in 2018 and program attendance has increased 213% from 38,500 to 121,000 during that same 5 years. WHEN YOU CONSIDER THE ADA COMMUNITY LIBRARIES, DOESN’T MERIDIAN HAVE SUFFICIENT LIBRARY RESOURCES? Ada Community Libraries are a separate library system. MLD created this plan with consideration of the demand we are seeing in our own branches. Meridian taxpayers pay for Meridian Library services and through the LYNX library partnership, they are able to use neighboring library systems.